During the 1980s I was visiting my aunt and uncle in the LA area. My uncle told me about his fiftieth reunion which had taken place a couple of weeks prior to my visit. He said, “Betty and I got all dressed up and headed toward the nearby hotel where the reunion was being held, but as we turned into the parking lot I looked at her and told her I didn’t want to see those people. I wanted to remember them the way they were, not the way they are now. We turned out of the parking lot and went to a restaurant and had a quiet dinner.” This was surprising to me as they had been a power couple in high school and had attended all prior reunions – and enjoyed the events. Yet, that’s how I feel about my class. In the early 1970s we were young, fresh, full of life, and the opportunities lying before us were unlimited. I want my memories to be of a bunch of fresh-faced seventeen-year-olds graduating from a brand-new high school. When speaking to my wife I still refer to that building as the new high school. My memories of the school are stuck in 1973 and perhaps it’s best for me to keep its people confined there as well. It’s nearly spring and preparations for the annual onslaught of high school reunions are in full swing. Mostly, the same kids who ruled the roost senior year are the ones you will hear from trying to get you to attend the big party. After all, it is a difficult task to showcase oneself without a meaningful audience. An audience with vivid memories of the way you were back then, all those years ago. An audience that collectively will remember the social order of the time, remember who the power couples were, remember who is in charge. That may sound harsh and bitter but it really is not. Rather it is accepting the reality of the high school society microcosm. The same few people were always front and center, with the masses just filling bleacher seats, not unlike the extras in a crowd during the shooting of a movie scene. Does anyone for a minute believe the shooting of the scene has anything to do with the extras? Of course not, they are there to fill space and showcase the stars. So goes the reunion. The masses are a part of the party, yet unaware of the true agenda, the tragedy – to celebrate the same few people we have always celebrated. To quote my wife, “High school never ends.” So sad, but so true. Grasping the essence of the high school social order early on afforded me the opportunity to both retain my independence and recognize that the socially deviant behavior benefiting a few at the expense of the many was in fact the reality awaiting us as adults. Are not the masses comprising the lower and middle classes of our country just the paying audience for the select few that occupy our nation’s capital? And, while they live the high life, we pay the taxes to support the mischief they enjoy causing. I have been successful in avoiding high school reunions for just over forty years. I graduated in 1973. By 1978 I had moved across the mountains six hours away. I might have been enticed or intrigued to attend a soiree a year or so out of college, but our somewhat low-functioning class didn’t have that most famous of all reunions – the five year reunion. If it wasn’t apparent to most during high school, by the five-year post-graduation mark it’s quite clear who’s headed for success and who’s headed somewhere else. Though if you have a good line of BS, at five years you can pull off an act that makes it appear you are headed for success. The great thing about five years is most of us pretty much look the same as we did at graduation, which I must say is a good thing. Perhaps a pant size larger, but pretty much identifiable from a well worn copy of the year book. Add another five years and you hit ten. By ten years those of us that are going to make it big are well on our way. Not many of us can bluff success at this point in time. Those who had always seemed to fall behind are by now hopelessly behind. At ten years, some wallflowers have blossomed. Some of the nerdy guys look distinguished – and rich. The ‘glory days’ jocks working at the local factory have put on twenty pounds in sympathy for their high school sweethearts who have given birth at least of a couple of times. Ten years provides those that have made it in real life, but perhaps struggled in high school, some sweet revenge. It adds an interesting level of stressful dynamics for everyone. 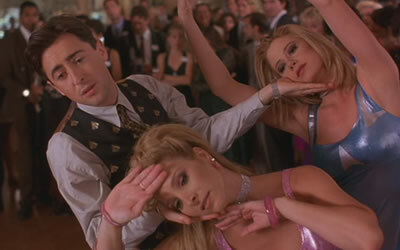 Think back to the 1997 film, Romy and Michele’s High School Reunion. A very funny chick flick capturing the essence of the ten year reunion. The two girls hadn’t achieved much success in life and on the long drive to the reunion decided that they would claim to have invented Post It Notes. A back-story that didn’t turn out so well for them. My class failed to hold a five or ten year reunion opting instead for an eight year reunion. Who does that? I was living in Indiana and unable to make it out west that summer. The next reunion I heard about was a thirty-eight year reunion – really what is it about the number eight? By that time I was living in the area and planned on attending. Fortunately a family emergency took me to Ohio and I missed it. I got a second chance two years later for our fortieth, looks like we are getting back on schedule. Once again I was planning to attend when my daughter announced she was getting married on the very weekend reserved for the reunion. Bummer? At that point my former classmates had had their fill with me. Some actually sounded irate that I would attend my daughter’s wedding and miss a reunion with a bunch of people I wouldn’t recognize and hadn’t seen in forty years. I have run across some of my classmates through time. Some because we are still friends others because we had a thread of life in common all these years. Like the guy I had dinner with in Montana a couple years ago. We knew each other in school, but barely. Through some facebook posts we figured out we had worked at the same firm for a while and in the same industry for thirty years. That bit of serendipity brought Tom and I together through our common path in life. That’s the kind of reunion I cherish. I would like to spend a little bit of face time individually with each of my classmates who during high school I had significant personal interaction with. I don’t want to offend anyone, but looking through my year book there are only a couple of dozen pictures meeting that criterion. And some of those are from the class of ’74! With a class of around 285 in ‘73 that’s nearly 10% which is more than I would have guessed. If you’re one of the twenty-four you may hear from me one day. I’m definitely a small group kind of guy. Without an anchor, over time we drift away from those we once knew well. Depending on the current and winds it may take a long time to get back to where you started. When I left Washington in 1979, I pulled anchor and headed to sea on my life’s journey without ever once looking back. Safe travels. This entry was posted in Family, Personal Finance and tagged etiquette, graduation, high school, humor, life, musings, real life, reflection, reunion, satire on March 17, 2014 by Terry.